teammates on the ice for a skate with the cup. being hit by Philly’s Claude Giroux. become the hot-button issue, not only in hockey, but throughout professional sports. The hit that ended Savard’s season, and the hit on Bergeron show how susceptible players with a history of concussions are to further injury. Being medically cleared to play does not mean that a player is fully recovered. Remember, Savard was cleared by doctors to play on two separate occasions despite the fact that he was clearly not playing at a hundred percent. final. In this day and age, Richard, like Horton, would have been taken off the ice on a stretcher and then brought to hospital. forward has seen little contact and has not yet dressed for a pre-season game. But Horton insists that this is not due to any lingering symptoms; rather, the team is not taking any unnecessary chances by bringing him back too soon. “Obviously I want to get back” said Horton. “I'm here, I want to play. But it's nice to ease my way back into it and get back into things.” Welcome back, Horty, take all the time you need. 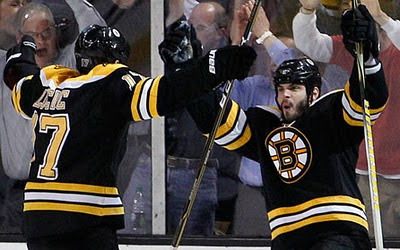 Click here to purchase tickets to any of the Bruins sure to be exciting home games at the Garden.